NEWARK, N.J. (AP) -Bouncing back from a bad game and putting themselves in position to be the top seed in the Eastern Conference was more exciting for the Pittsburgh Penguins than making the playoffs. Less than 24 hours after an embarrassing loss to the New York Islanders, the Penguins clinched a playoff berth and took a big step toward the top seed, beating the New Jersey Devils 2-0 on Tuesday night behind a 31-save performance by Marc-Andre Fleury. "We've been doing this all year, bouncing back after a poor performance," said Ryan Malone, whose first-period goal proved to be the game-winner. "I think that shows a lot of character." Marian Hossa added an empty-net goal for the Penguins, who opened a four-point lead over the second-place Devils in the Atlantic Division and pulled within a point of Montreal for the best record in the conference. Pittsburgh and the Canadiens have five games to play in the regular season, one less than the Devils, whose four-game winless streak (0-3-1) matches their season high. Defenseman Sergei Gonchar sent a pass to the left circle and Ryan Whitney found Malone alone between the circles for a one-timer that beat goalie Martin Brodeur. It extended Malone's career-best goal total to 27. The Devils thought they tied the game midway through the second period when defenseman Sheldon Brookbank put a power-play shot into the net with Fleury down after being bumped by Arron Asham of the Devils. Referee Eric Furlatt immediately waved off the goal, ruling that Asham prevented the goalie from playing the puck. 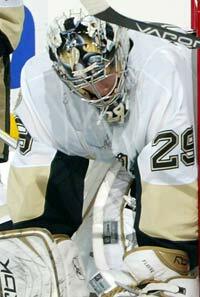 "The guy ran into me," said Fleury, who is 7-1 since returning from a high ankle sprain that caused him to miss 35 games. "It was obstruction, I guess. They said I couldn't play the puck." Devils coach Brent Sutter said Penguins defenseman Kris Letang lost his stick on the play, wrapped his arms around Asham and pushed him into the goaltender. "It wasn't like he skated intentionally trying to hit the goalie," Sutter said. "It's the ref's decision, his call. I'm not going to sit here and blame the officiating tonight." Fleury stopped 16 shots in the third period in posting his fourth shutout of the season and the 11th of his career. The 23-year-old stopped Jamie Langenbrunner in close on a power play early in the period and stopped deflections by Zach Parise and Elias just seconds apart with less than nine minutes to play. "This was huge for us," Fleury said. "The race is really tight. The Devils are a tough team to beat. This was a good win for us." It marked the 10th time this season that New Jersey has been shut out. "Right now we just have to stay with it," Elias said. "I thought we played pretty good tonight and got better as the game went on. In the third, we had the game on our sticks. We created opportunities and shots. We have to stay with it. The puck will go in eventually." Penguins captain Sidney Crosby sat out his seventh straight game and 28th in 31 because of a sprained right ankle. 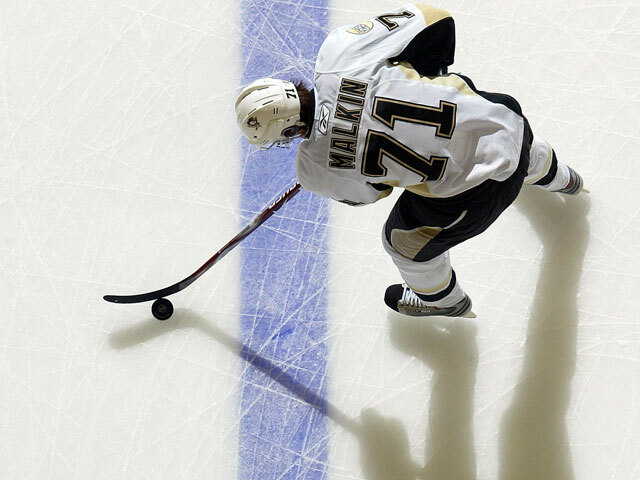 Pittsburgh is 16-8-4 without him, including 5-2 in the past seven. Crosby has been listed day to day and the Penguins hope he will play Thursday in Pittsburgh against the Islanders. Notes: Devils LW Jay Pandolfo played in his 700th game. ... Penguins RW Pascal Dupuis missed his second straight game following the birth of his daughter, Zoe, on Monday. The Penguins and Devils each won four times in their eight-game season series.